Oprah’s Favorite Things has reached legendary status. After years of giving away freebies big and small on her departed talk show, the list went on hiatus last year, but returned in full force last Sunday. Her OWN network brought it back by broadcasting a dedicated two-hour special, cementing this event as its own hotly anticipated entity. Such is the power of giving away droolworthy gifts. This time around, Oprah “benefactored” the heck out of military wives, bestowing all manner of products, including peanut butter, an elliptical machine and an “aMAAAZing” trip to Fiji. But it didn’t end there. 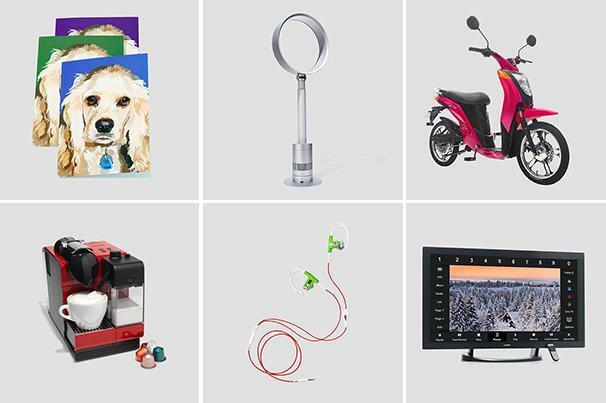 The producer/actress/on-air personality/tastemaker has long been a fan of technology, often including gadgets in her favorite things, and this year’s list was no different. 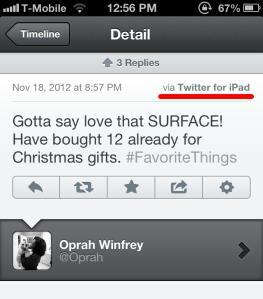 Two years after Oprah proclaimed her love of the iPad, she now sets her sights on the MS Surface. With its inclusion on this year’s list, it now has the best advertising ever, having just been introduced to an incredibly mainstream audience. And if the “Oprah Effect” holds up, sales should be a no-brainer. The techie crowd may note, however, that Ms. O was so enamored of the Surface that she couldn’t resist tweeting about it… on her iPad. Oopsie. This faux pas is kicking up quite a kerfluffle on the webs, due in part to the fact that it casts a spotlight on Twitter’s lack of an official Windows RT app. And that speaks to the newness of a platform that hasn’t been vetted in the marketplace just yet. Still, that doesn’t stop the celebrity from gushing about the device. In her own words, she says it “feels like a Mercedes-Benz.” Those are some powerful words from one very powerful lady. Scrabble HD for Microsoft Surface: “You all know how much I love to play Scrabble. Now it’s in HD!” Scrabble HD will be available on the Microsoft Surface in 2013. And then there’s this, a sort of tech-ish, but unusual entry: A Set of Wagging Tail Custom Portrait Cards ($229 for 50 cards, $199 with code OPRAH). The service takes users’ submitted pet photos and turns them into computer-illustrated customized greeting cards. What’s even stranger is the price tag. $200 or more bucks for this? I know some people are crazy about their pets, but… just wow. And third — if you’re interested in buying any one of these items for yourself or a loved one, don’t delay. There will probably be a rush on some of these, thanks to the Oprah Effect.